Hi there! Today I’m sharing my review for QUINN INVISIBLE, a YA mystery/romance that really packs a gut punch. I really enjoyed IN YOUR DREAMS and AS YOU WAKE, books in Amy Martin’s In Your Dreams series, so I was eager to read QUINN, and I was not disappointed. When her cop father is killed in the line of duty, Quinn Callahan returns from New York to her hometown of Shady Springs, Missouri, to live with her aunt. Unfortunately, Shady Springs holds nothing but pain for Quinn, whose mother allegedly murdered Quinn’s popular best friend Emma before killing herself, leaving Quinn a bullied outcast at her upscale prep school. After almost four years away, Quinn finds not much has changed at Harrandale Preparatory Academy, although her bullies have grown older, taller, and crueler. And Emma’s twin brother Evan is still indifferent to her, which is more painful than any punishment her classmates can inflict. Determined to clear her mother’s name, Quinn begins re-investigating Emma’s death with the help of some new friends and–eventually–Evan. But will Quinn and Evan be able to live with what they learn about their families in the process? Quinn is an orphan–but it’s worse than that. Four years ago her mother was implicated in a murder-suicide that also ended the life of Quinn’s BFF, Emma. Quinn and Emma’s twin, Evan, had been developing a romance–which is completely derailed by Emma’s death–and Evan’s mother committed suicide a month later, leaving both Quinn and Evan mother-less. Quinn’s father, a police detective, was fired for copying the case files surrounding his wife’s death, hoping to solve the mystery in a way that exonerated the woman he loved, but he’s caught and fired–so he moves to NYC with Quinn, and the book opens with Quinn’s father being killed in action in NYC. Quinn is forced to return to the affluent St. Louis suburb she fled four years prior as a pariah. Her paternal aunt has custody and is determined to follow Quinn’s father’s wishes by sending Quinn to the prep school she had attended with Emma and Evan–only now Evan is aloof (understandably) and all the in-kids are busy making life super difficult for Quinn. Quinn manages to get befriended by Seti and Hal, an odd couple who keep their relationship on the down-low from Seti’s parents who are happily planning her medical career and arranged marriage. They reach out and help in ways that are realistic and awesome. Their biggest assistance is with sorting through the copied case files that Quinn discovered amongst her father’s effects. It becomes Quinn’s mission to clear her mother’s name–if not for her own sanity, to restore the balance between herself and Evan. There is a romance here. Evan is conflicted about his affection for the girl he’d begun to love before his world axis was tilted, twice. It is cautious, and age-appropriate, with little more than kissing on the page. Still, that is a real problem for Quinn, whose investigation seems to implicate people VERY close to Evan perpetrating a double murder. So, clear her mom? Or break Evan’s heart yet again–by revealing what she learns. Quinn makes a good choice, even though it messes up her life even more. Considering all that she learns in this investigation, it turns out Quinn’s life was pretty messed up before, though she had no idea about that. I really enjoyed this read. The pacing is great, the relationships are real, and Quinn is a main character who is steady and true to her purpose. The end was not far from what I expected, but the twist makes the sequel a necessity. Not a cliffhanger, but there is certainly enough work for Quinn to undertake in her mission to fill another book. Interested? 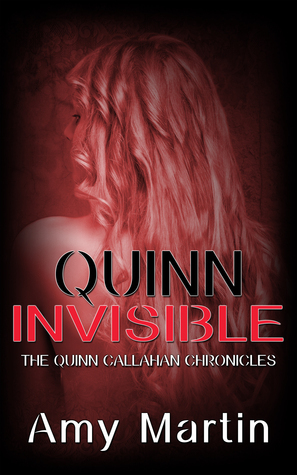 You can find QUINN INVISIBLE on Goodreads, Amazon, Smashwords, Barnes and Noble, iBooks, and Kobo. Amy Martin wrote and illustrated her first book at the age of ten and gave it to her fourth grade teacher, who hopefully lost it in her house somewhere and didn’t share it with anyone else. The first novel she published as a grown-up, In Your Dreams, was a 2012 Amazon Breakthrough Novel Award Semi-finalist in Young Adult Fiction. In Your Dreams was the first of a four book series (In Your Dreams, As You Wake, Before You Sleep, and Beyond Your Dreams). Her latest novel, Quinn Invisible, will debut in August 2015. 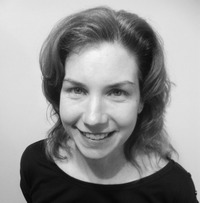 Amy currently lives in Lexington, KY with her husband and a ferocious attack tabby named Cleo. When not writing or reading, she can usually be found watching sports, drinking coffee, or indulging her crippling Twitter habit (and, sometimes, doing all three at once). You can find Amy online on her website, Goodreads, Facebook and twitter.